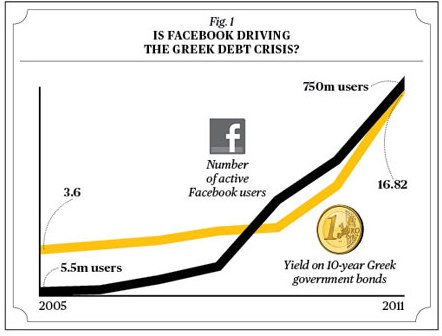 Despite this strong correlation, it would not be wise to conclude that the success of Facebook has somehow caused the current (2009-2012) Greek debt crisis, nor that the Greek debt crisis has caused the adoption of Facebook! Of course, while it’s all very well to piously state that correlation doesn’t imply causation, it does leave us with a conundrum: under what conditions, exactly, can we use experimental data to deduce a causal relationship between two or more variables? The standard scientific answer to this question is that (with some caveats) we can infer causality from a well designed randomized controlled experiment. Unfortunately, while this answer is satisfying in principle and sometimes useful in practice, it’s often impractical or impossible to do a randomized controlled experiment. And so we’re left with the question of whether there are other procedures we can use to infer causality from experimental data. And, given that we can find more general procedures for inferring causal relationships, what does causality mean, anyway, for how we reason about a system? It might seem that the answers to such fundamental questions would have been settled long ago. In fact, they turn out to be surprisingly subtle questions. Over the past few decades, a group of scientists have developed a theory of causal inference intended to address these and other related questions. This theory can be thought of as an algebra or language for reasoning about cause and effect. Many elements of the theory have been laid out in a famous book by one of the main contributors to the theory, Judea Pearl. Although the theory of causal inference is not yet fully formed, and is still undergoing development, what has already been accomplished is interesting and worth understanding. In this post I will describe one small but important part of the theory of causal inference, a causal calculus developed by Pearl. This causal calculus is a set of three simple but powerful algebraic rules which can be used to make inferences about causal relationships. In particular, I’ll explain how the causal calculus can sometimes (but not always!) be used to infer causation from a set of data, even when a randomized controlled experiment is not possible. Also in the post, I’ll describe some of the limits of the causal calculus, and some of my own speculations and questions. The post is a little technically detailed at points. However, the first three sections of the post are non-technical, and I hope will be of broad interest. Throughout the post I’ve included occasional “Problems for the author”, where I describe problems I’d like to solve, or things I’d like to understand better. Feel free to ignore these if you find them distracting, but I hope they’ll give you some sense of what I find interesting about the subject. Incidentally, I’m sure many of these problems have already been solved by others; I’m not claiming that these are all open research problems, although perhaps some are. They’re simply things I’d like to understand better. Also in the post I’ve included some exercises for the reader, and some slightly harder problems for the reader. You may find it informative to work through these exercises and problems. Before diving in, one final caveat: I am not an expert on causal inference, nor on statistics. The reason I wrote this post was to help me internalize the ideas of the causal calculus. Occasionally, one finds a presentation of a technical subject which is beautifully clear and illuminating, a presentation where the author has seen right through the subject, and is able to convey that crystalized understanding to others. That’s a great aspirational goal, but I don’t yet have that understanding of causal inference, and these notes don’t meet that standard. Nonetheless, I hope others will find my notes useful, and that experts will speak up to correct any errors or misapprehensions on my part. Let me start by explaining two example problems to illustrate some of the difficulties we run into when making inferences about causality. The first is known as Simpson’s paradox. To explain Simpson’s paradox I’ll use a concrete example based on the passage of the Civil Rights Act in the United States in 1964. Yes, you read that right: in both the North and the South, a larger fraction of Democrats than Republicans voted for the Act, despite the fact that overall a larger fraction of Republicans than Democrats voted for the Act. You might wonder how this can possibly be true. I’ll quickly state the raw voting numbers, so you can check that the arithmetic works out, and then I’ll explain why it’s true. You can skip the numbers if you trust my arithmetic. One way of understanding what’s going on is to note that a far greater proportion of Democrat (as opposed to Republican) legislators were from the South. In fact, at the time the House had 94 Democrats, and only 10 Republicans. Because of this enormous difference, the very low fraction (7 percent) of southern Democrats voting for the Act dragged down the Democrats’ overall percentage much more than did the even lower fraction (0 percent) of southern Republicans who voted for the Act. If we take a naive causal point of view, this result looks like a paradox. As I said above, the overall voting pattern seems to suggest that being Republican, rather than Democrat, was an important causal factor in voting for the Civil Rights Act. Yet if we look at the individual statistics in both the North and the South, then we’d come to the exact opposite conclusion. To state the same result more abstractly, Simpson’s paradox is the fact that the correlation between two variables can actually be reversed when additional factors are considered. So two variables which appear correlated can become anticorrelated when another factor is taken into account. You might wonder if results like those we saw in voting on the Civil Rights Act are simply an unusual fluke. But, in fact, this is not that uncommon. Wikipedia’s page on Simpson’s paradox lists many important and similar real-world examples ranging from understanding whether there is gender-bias in university admissions to which treatment works best for kidney stones. In each case, understanding the causal relationships turns out to be much more complex than one might at first think. I’ll now go through a second example of Simpson’s paradox, the kidney stone treatment example just mentioned, because it helps drive home just how bad our intuitions about statistics and causality are. Imagine you suffer from kidney stones, and your Doctor offers you two choices: treatment A or treatment B. Your Doctor tells you that the two treatments have been tested in a trial, and treatment A was effective for a higher percentage of patients than treatment B. If you’re like most people, at this point you’d say “Well, okay, I’ll go with treatment A”. Here’s the gotcha. Keep in mind that this really happened. Suppose you divide patients in the trial up into those with large kidney stones, and those with small kidney stones. Then even though treatment A was effective for a higher overall percentage of patients than treatment B, treatment B was effective for a higher percentage of patients in both groups, i.e., for both large and small kidney stones. So your Doctor could just as honestly have said “Well, you have large [or small] kidney stones, and treatment B worked for a higher percentage of patients with large [or small] kidney stones than treatment A”. If your Doctor had made either one of these statements, then if you’re like most people you’d have decided to go with treatment B, i.e., the exact opposite treatment. The kidney stone example relies, of course, on the same kind of arithmetic as in the Civil Rights Act voting, and it’s worth stopping to figure out for yourself how the claims I made above could possibly be true. If you’re having trouble, you can click through to the Wikipedia page, which has all the details of the numbers. Now, I’ll confess that before learning about Simpson’s paradox, I would have unhesitatingly done just as I suggested a naive person would. Indeed, even though I’ve now spent quite a bit of time pondering Simpson’s paradox, I’m not entirely sure I wouldn’t still sometimes make the same kind of mistake. I find it more than a little mind-bending that my heuristics about how to behave on the basis of statistical evidence are obviously not just a little wrong, but utterly, horribly wrong. Perhaps I’m alone in having terrible intuition about how to interpret statistics. But frankly I wouldn’t be surprised if most people share my confusion. I often wonder how many people with real decision-making power – politicians, judges, and so on – are making decisions based on statistical studies, and yet they don’t understand even basic things like Simpson’s paradox. Or, to put it another way, they have not the first clue about statistics. Partial evidence may be worse than no evidence if it leads to an illusion of knowledge, and so to overconfidence and certainty where none is justified. It’s better to know that you don’t know. As a second example of the difficulties in establishing causality, consider the relationship between cigarette smoking and lung cancer. In 1964 the United States’ Surgeon General issued a report claiming that cigarette smoking causes lung cancer. Unfortunately, according to Pearl the evidence in the report was based primarily on correlations between cigarette smoking and lung cancer. As a result the report came under attack not just by tobacco companies, but also by some of the world’s most prominent statisticians, including the great Ronald Fisher. They claimed that there could be a hidden factor – maybe some kind of genetic factor – which caused both lung cancer and people to want to smoke (i.e., nicotine craving). If that was true, then while smoking and lung cancer would be correlated, the decision to smoke or not smoke would have no impact on whether you got lung cancer. Now, you might scoff at this notion. But derision isn’t a principled argument. And, as the example of Simpson’s paradox showed, determining causality on the basis of correlations is tricky, at best, and can potentially lead to contradictory conclusions. It’d be much better to have a principled way of using data to conclude that the relationship between smoking and lung cancer is not just a correlation, but rather that there truly is a causal relationship. One way of demonstrating this kind of causal connection is to do a randomized, controlled experiment. We suppose there is some experimenter who has the power to intervene with a person, literally forcing them to either smoke (or not) according to the whim of the experimenter. The experimenter takes a large group of people, and randomly divides them into two halves. One half are forced to smoke, while the other half are forced not to smoke. By doing this the experimenter can break the relationship between smoking and any hidden factor causing both smoking and lung cancer. By comparing the cancer rates in the group who were forced to smoke to those who were forced not to smoke, it would then be possible determine whether or not there is truly a causal connection between smoking and lung cancer. This kind of randomized, controlled experiment is highly desirable when it can be done, but experimenters often don’t have this power. In the case of smoking, this kind of experiment would probably be illegal today, and, I suspect, even decades into the past. And even when it’s legal, in many cases it would be impractical, as in the case of the Civil Rights Act, and for many other important political, legal, medical, and econonomic questions. To help address problems like the two example problems just discussed, Pearl introduced a causal calculus. In the remainder of this post, I will explain the rules of the causal calculus, and use them to analyse the smoking-cancer connection. We’ll see that even without doing a randomized controlled experiment it’s possible (with the aid of some reasonable assumptions) to infer what the outcome of a randomized controlled experiment would have been, using only relatively easily accessible experimental data, data that doesn’t require experimental intervention to force people to smoke or not, but which can be obtained from purely observational studies. This is a quite general model of causal relationships, in the sense that it includes both the suggestion of the US Surgeon General (smoking causes cancer) and also the suggestion of the tobacco companies (a hidden factor causes both smoking and cancer). Indeed, it also allows a third possibility: that perhaps both smoking and some hidden factor contribute to lung cancer. This combined relationship could potentially be quite complex: it could be, for example, that smoking alone actually reduces the chance of lung cancer, but the hidden factor increases the chance of lung cancer so much that someone who smokes would, on average, see an increased probability of lung cancer. This sounds unlikely, but later we’ll see some toy model data which has exactly this property. Of course, the model depicted in the graph above is not the most general possible model of causal relationships in this system; it’s easy to imagine much more complex causal models. But at the very least this is an interesting causal model, since it encompasses both the US Surgeon General and the tobacco company suggestions. I’ll return later to the possibility of more general causal models, but for now we’ll simply keep this model in mind as a concrete example of a causal model. Each vertex in this causal model has an associated random variable, . 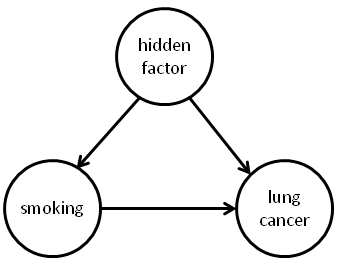 For example, in the causal model above could be a two-outcome random variable indicating the presence or absence of some gene that exerts an influence on whether someone smokes or gets lung cancer, indicates “smokes” or “does not smoke”, and indicates “gets lung cancer” or “doesn’t get lung cancer”. 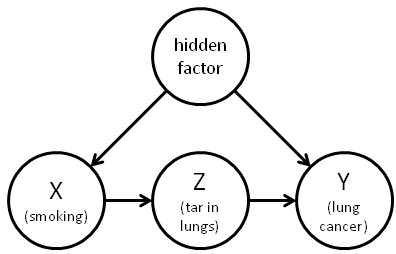 The other variables and would refer to other potential dependencies in this (somewhat more complex) model of the smoking-cancer connection. A notational convention that we’ll use often is to interchangeably use to refer to a random variable in the causal model, and also as a way of labelling the corresponding vertex in the graph for the causal model. It should be clear from context which is meant. We’ll also sometimes refer interchangeably to the causal model or to the associated graph. We can’t have causing causing causing ! At least, not without a time machine. Because of this we constrain the graph to be a directed acyclic graph, meaning a (directed) graph which has no loops in it. By the way, I must admit that I’m not a fan of the term directed acyclic graph. It sounds like a very complicated notion, at least to my ear, when what it means is very simple: a graph with no loops. I’d really prefer to call it a “loop-free graph”, or something like that. Unfortunately, the “directed acyclic graph” nomenclature is pretty standard, so we’ll go with it. 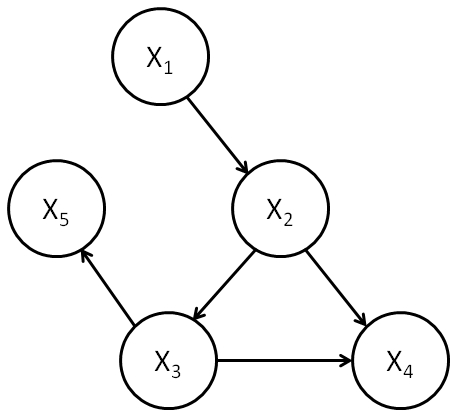 Our picture so far is that a causal model consists of a directed acyclic graph, whose vertices are labelled by random variables . To complete our definition of causal models we need to capture the allowed relationships between those random variables. Now, of course, vertices further back in the graph – say, the parents of the parents – could, of course, influence the value of . But it would be indirect, an influence mediated through the parent vertices. Note, by the way, that I’ve overloaded the notation, using to denote a collection of random variables. I’ll use this kind of overloading quite a bit in the rest of this post. In particular, I’ll often use the notation (or , or ) to denote a subset of random variables from the graph. where is a function, and is a collection of random variables such that: (a) the are independent of one another for different values of ; and (b) for each , is independent of all variables , except when is itself, or a descendant of . The intuition is that the are a collection of auxiliary random variables which inject some extra randomness into (and, through , its descendants), but which are otherwise independent of the variables in the causal model. Summing up, a causal model consists of a directed acyclic graph, , whose vertices are labelled by random variables, , and each is expressible in the form for some function . The are independent of one another, and each is independent of all variables , except when is or a descendant of . I won’t prove this equation, but the expression should be plausible, and is pretty easy to prove; I’ve asked you to prove it as an optional exercise below. Prove the above equation for the joint probability distribution. (Simpson’s paradox in causal models) Consider the causal model of smoking introduced above. Suppose that the hidden factor is a gene which is either switched on or off. If on, it tends to make people both smoke and get lung cancer. Find explicit values for conditional probabilities in the causal model such that , and yet if the additional genetic factor is taken into account this relationship is reversed. That is, we have both and . 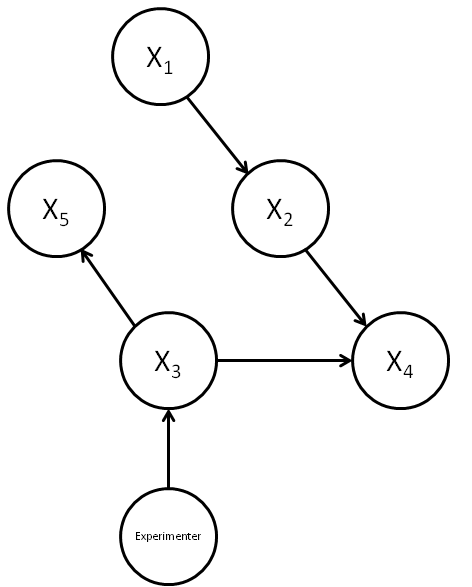 An alternate, equivalent approach to defining causal models is as follows: (1) all root vertices (i.e., vertices with no parents) in the graph are labelled by independent random variables. (2) augment the graph by introducing new vertices corresponding to the . These new vertices have single outgoing edges, pointing to . (3) Require that non-root vertices in the augmented graph be deterministic functions of their parents. The disadvantage of this definition is that it introduces the overhead of dealing with the augmented graph. But the definition also has the advantage of cleanly separating the stochastic and deterministic components, and I wouldn’t be surprised if developing the theory of causal inference from this point of view was stimulating, at the very least, and may possibly have some advantages compared to the standard approach. So the problem I set myself (and anyone else who is interested!) is to carry the consequences of this change through the rest of the theory of causal inference, looking for advantages and disadvantages. will have a causal influence on through its influence on and . This would be an indirect causal influence, mediated by other random variables, but it would still be a causal influence. In the next section I’ll give a more formal definition of causal influence that can be used to make these ideas precise. In this section I’ll explain what I think is the most imaginative leap underlying the causal calculus. It’s the introduction of the concept of causal conditional probabilities. The notion of ordinary conditional probabilities is no doubt familiar to you. It’s pretty straightforward to do experiments to estimate conditional probabilities such as , simply by looking at the population of people who smoke, and figuring out what fraction of those people develop cancer. Unfortunately, for the purpose of understanding the causal relationship between smoking and cancer, isn’t the quantity we want. As the tobacco companies pointed out, there might well be a hidden genetic factor that makes it very likely that you’ll see cancer in anyone who smokes, but that wouldn’t therefore mean that smoking causes cancer. As we discussed earlier, what you’d really like to do in this circumstance is a randomized controlled experiment in which it’s possible for the experimenter to force someone to smoke (or not smoke), breaking the causal connection between the hidden factor and smoking. In such an experiment you really could see if there was a causal influence by looking at what fraction of people who smoked got cancer. In particular, if that fraction was higher than in the overall population then you’d be justified in concluding that smoking helped cause cancer. In practice, it’s probably not practical to do this kind of randomized controlled experiment. But Pearl had what turns out to be a very clever idea: to imagine a hypothetical world in which it really is possible to force someone to (for example) smoke, or not smoke. In particular, he introduced a conditional causal probability , which is the conditional probability of cancer in this hypothetical world. This should be read as the (causal conditional) probability of cancer given that we “do” smoking, i.e., someone has been forced to smoke in a (hypothetical) randomized experiment. Now, at first sight this appears a rather useless thing to do. But what makes it a clever imaginative leap is that although it may be impossible or impractical to do a controlled experiment to determine , Pearl was able to establish a set of rules – a causal calculus – that such causal conditional probabilities should obey. And, by making use of this causal calculus, it turns out to sometimes be possible to infer the value of probabilities such as , even when a controlled, randomized experiment is impossible. And that’s a very remarkable thing to be able to do, and why I say it was so clever to have introduced the notion of causal conditional probabilities. This model has no vertex explicitly representing the experimenter, but rather the relation is replaced by the relation . We will denote this graph by , indicating the graph in which all edges pointing to have been deleted. We will call this a perturbed graph, and the corresponding causal model a perturbed causal model. In the perturbed causal model the only change is to delete the edges to , and to replace the relation by the relation . What we’d like is to compute . Unfortunately, we immediately run into a problem if we try to use the expression on the right of equation : we’ve got no way of estimating the conditional probabilities for smoking given the hidden common factor. So we can’t obviously compute . And, as you can perhaps imagine, this is the kind of problem that will come up a lot whenever we’re worried about the possible influence of some hidden factor. All is not lost, however. Just because we can’t compute the expression on the right of  directly doesn’t mean we can’t compute causal conditional probabilities in other ways, and we’ll see below how the causal calculus can help solve this kind of problem. It’s not a complete solution – we shall see that it doesn’t always make it possible to compute causal conditional probabilities. But it does help. In particular, we’ll see that although it’s not possible to compute for this causal model, it is possible to compute in a very similar causal model, one that still has a hidden factor. With causal conditional probabilities defined, we’re now in position to define more precisely what we mean by causal influence. Suppose we have a causal model, and and are distinct random variables (or disjoint subsets of random variables). Then we say has a causal influence over if there are values and of and of such that . In other words, an external experimenter who can intervene to change the value of can cause a corresponding change in the distribution of values at . The following exercise gives an information-theoretic justification for this definition of causal influence: it shows that an experimenter who can intervene to set can transmit information to if and only if the above condition for causal inference is met. (The causal capacity) This exercise is for people with some background in information theory. Suppose we define the causal capacity between and to be , where is the mutual information, the maximization is over possible distributions for (we use the hat to indicate that the value of is being set by intervention), and is the corresponding random variable at , with distribution . Shannon’s noisy channel coding theorem tells us that an external experimenter who can intervene to set the value of can transmit information to an observer at at a maximal rate set by the causal capacity. Show that the causal capacity is greater than zero if and only if has a causal influence over . Suppose and are random variables in a causal model such that for some pair of values and . Does this imply that exerts a causal influence on ? (Sum-over-paths for causal conditional probabilities?) I believe a kind of sum-over-paths formulation of causal conditional probabilities is possible, but haven’t worked out details. The idea is as follows (the details may be quite wrong, but I believe something along these lines should work). Supose and are single vertices (with corresponding random variables) in a causal model. Then I would like to show first that if is not an ancestor of then , i.e., intervention does nothing. Second, if is an ancestor of then may be obtained by summing over all directed paths from to in , and computing for each path a contribution to the sum which is a product of conditional probabilities along the path. (Note that we may need to consider the same path multiple times in the sum, since the random variables along the path may take different values). We used causal models in our definition of causal conditional probabilities. But our informal definiton – imagine a hypothetical world in which it’s possible to force a variable to take a particular value – didn’t obviously require the use of a causal model. Indeed, in a real-world randomized controlled experiment it may be that there is no underlying causal model. This leads me to wonder if there is some other way of formalizing the informal definition we’ve given? Another way of framing the last problem is that I’m concerned about the empirical basis for causal models. How should we go about constructing such models? Are they fundamental, representing true facts about the world, or are they modelling conveniences? (This is by no means a dichotomy.) It would be useful to work through many more examples, considering carefully the origin of the functions and of the auxiliary random variables . In this section we’ll develop a criterion that Pearl calls directional separation (d-separation, for short). What d-separation does is let us inspect the graph of a causal model and conclude that a random variable in the model can’t tell us anything about the value of another random variable in the model, or vice versa. To understand d-separation we’ll start with a simple case, and then work through increasingly complex cases, building up our intuition. I’ll conclude by giving a precise definition of d-separation, and by explaining how d-separation relates to the concept of conditional independence of random variables. Clearly, knowing can in general tell us something about in this kind of causal model, and so in this case and are not d-separated. We’ll use the term d-connected as a synonym for “not d-separated”, and so in this causal model and are d-connected. A useful piece of terminology is to say that a vertex like the middle vertex in this model is a collider for the path from to , meaning a vertex at which both edges along the path are incoming. In this case, it is possible that knowing will tell us something about , because of their common ancestry. It’s like the way knowing the genome for one sibling can give us information about the genome of another sibling, since similarities between the genomes can be inferred from the common ancestry. We’ll call a vertex like the middle vertex in this model a fork for the path from to , meaning a vertex at which both edges are outgoing. Construct an explicit causal model demonstrating the assertion of the last paragraph. For example, you may construct a causal model in which and are joined by a fork, and where is actually a function of . Suppose we have a path from to in a causal model. Let be the number of colliders along the path, and let be the number of forks along the path. Show that can only take the values or , i.e., the number of forks and colliders is either the same or differs by at most one. We’ll say that a path (of any length) from to that contains a collider is a blocked path. By contrast, a path that contains no colliders is called an unblocked path. (Note that by the above exercise, an unblocked path must contain either one or no forks.) In general, we define and to be d-connected if there is an unblocked path between them. We define them to be d-separated if there is no such unblocked path. It’s worth noting that the concepts of d-separation and d-connectedness depend only on the graph topology and on which vertices and have been chosen. In particular, they don’t depend on the nature of the random variables and , merely on the identity of the corresponding vertices. 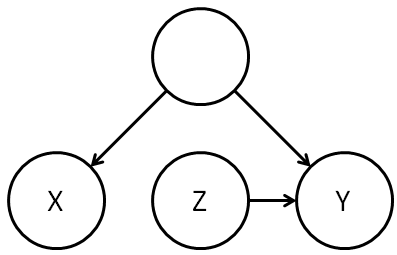 As a result, you can determine d-separation or d-connectdness simply by inspecting the graph. This fact – that d-separation and d-connectdness are determined by the graph – also holds for the more sophisticated notions of d-separation and d-connectedness we develop below. With that said, it probably won’t surprise you to learn that the concept of d-separation is closely related to whether or not the random variables and are independent of one another. This is a connection you can (optionally) develop through the following exercises. I’ll state a much more general connection below. Suppose that and are d-separated. Show that and are independent random variables, i.e., that . Suppose we have two vertices which are d-connected in a graph . Explain how to construct a causal model on that graph such that the random variables and corresponding to those two vertices are not independent. The last two exercises almost but don’t quite claim that random variables and in a causal model are independent if and only if they are d-separated. Why does this statement fail to be true? How can you modify the statement to make it true? Now, if we know , then knowing doesn’t give us any additional information about , since by our original definition of a causal model is already a function of and some auxiliary random variables which are independent of . So it makes sense to say that blocks this path from to , even though in the unconditioned case this path would not have been considered blocked. We’ll also say that and are d-separated, given . It is helpful to give a name to vertices like the middle vertex in Figure A, i.e., to vertices with one ingoing and one outgoing edge. We’ll call such vertices a traverse along the path from to . Using this language, the lesson of the above discussion is that if is in a traverse along a path from to , then the path is blocked. In this case, knowing will in general give us additional information about , even if we know . This is because while blocks one path from to there is another unblocked path from to . And so we say that and are d-connected, given . Again, if we know , then knowing as well doesn’t give us any extra information about (or vice versa). So we’ll say that in this case is blocking the path from to , even though in the unconditioned case this path would not have been considered blocked. Again, in this example and are d-separated, given . 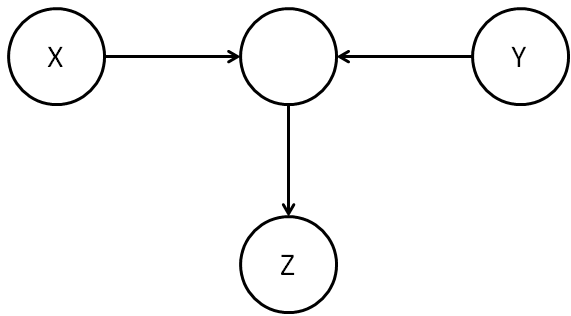 The lesson of this model is that if is located at a fork along a path from to , then the path is blocked. In the unconditioned case this would have been considered a blocked path. And, naively, it seems as though this should still be the case: at first sight (at least according to my intuition) it doesn’t seem very likely that can give us any additional information about (or vice versa), even given that is known. Yet we should be cautious, because the argument we made for the graph in Figure A breaks down: we can’t say, as we did for Figure A, that is a function of and some auxiliary independent random variables. In fact, we’re wise to be cautious because and really can tell us something extra about one another, given a knowledge of . This is a phenomenon which Pearl calls Berkson’s paradox. He gives the example of a graduate school in music which will admit a student (a possibility encoded in the value of ) if either they have high undergraduate grades (encoded in ) or some other evidence that they are exceptionally gifted at music (encoded in ). It would not be surprising if these two attributes were anticorrelated amongst students in the program, e.g., students who were admitted on the basis of exceptional gifts would be more likely than otherwise to have low grades. And so in this case knowledge of (exceptional gifts) would give us knowledge of (likely to have low grades), conditioned on knowledge of (they were accepted into the program). Another way of seeing Berkson’s paradox is to construct an explicit causal model for the graph in Figure B. Consider, for example, a causal model in which and are independent random bits, or , chosen with equal probabilities . We suppose that , where is addition modulo . This causal model does, indeed, have the structure of Figure B. But given that we know the value , knowing the value of tells us everything about , since . 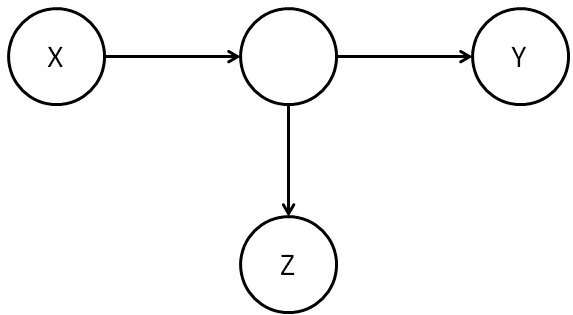 As a result of this discussion, in the causal graph of Figure B we’ll say that unblocks the path from to , even though in the unconditioned case the path would have been considered blocked. And we’ll also say that in this causal graph and are d-connected, conditional on . To see this, suppose we choose and as in the example just described above, i.e., independent random bits, or , chosen with equal probabilities . We will let the unlabelled vertex be . And, finally, we choose . Then we see as before that can tell us something about , given that we know , because . The general intuition about graphs like that in Figure C is that knowing allows us to infer something about the ancestors of , and so we must act as though those ancestors are known, too. As a result, in this case we say that unblocks the path from to , since has an ancestor which is a collider on the path from to . And so in this case is d-connected to , given . The reason, of course, is that it’s easy to construct examples where tells us something about in addition to what we already know from . And so we can’t consider and to be d-separated, given , in this example. Definition: Let , and be disjoint subsets of vertices in a causal model. Consider a path from a vertex in to a vertex in . We say the path is blocked by if the path contains either: (a) a collider which is not an ancestor of , or (b) a fork which is in , or (c) a traverse which is in . We say the path is unblocked if it is not blocked. We say that and are d-connected, given , if there is an unblocked path between some vertex in and some vertex in . and are d-separated, given , if they are not d-connected. Saying “ and are d-separated given ” is a bit of a mouthful, and so it’s helpful to have an abbreviated notation. We’ll use the abbreviation . Note that this notation includes the graph ; we’ll sometimes omit the graph when the context is clear. We’ll write to denote unconditional d-separation. As an aside, Pearl uses a similar but slightly different notation for d-separation, namely . Unfortunately, while the symbol looks like a LaTeX symbol, it’s not, but is most easily produced using a rather dodgy LaTeX hack. Instead of using that hack over and over again, I’ve adopted a more standard LaTeX notation. While I’m making asides, let me make a second: when I was first learning this material, I found the “d” for “directional” in d-separation and d-connected rather confusing. It suggested to me that the key thing was having a directed path from one vertex to the other, and that the complexities of colliders, forks, and so on were a sideshow. Of course, they’re not, they’re central to the whole discussion. For this reason, when I was writing these notes I considered changing the terminology to i-separated and i-connected, for informationally-separated and informationally-connected. Ultimately I decided not to do this, but I thought mentioning the issue might be helpful, in part to reassure readers (like me) who thought the “d” seemed a little mysterious. Okay, that’s enough asides, let’s get back to the main track of discussion. Theorem (graphical criterion for conditional independence): Let be a graph, and let , and be disjoint subsets of vertices in that graph. Then and are d-separated, given , if and only if for all causal models on the random variables corresponding to and are conditionally independent, given . The concept of d-separation plays a central role in the causal calculus. My sense is that it should be possible to find a cleaner and more intuitive definition that substantially simplifies many proofs. It’d be good to spend some time trying to find such a definition. We’ve now got all the concepts we need to state the rules of the causal calculus. There are three rules. The rules look complicated at first, although they’re easy to use once you get familiar with them. For this reason I’ll start by explaining the intuition behind the first rule, and how you should think about that rule. Having understood how to think about the first rule it’s easy to get the hang of all three rules, and so after that I’ll just outright state all three rules. 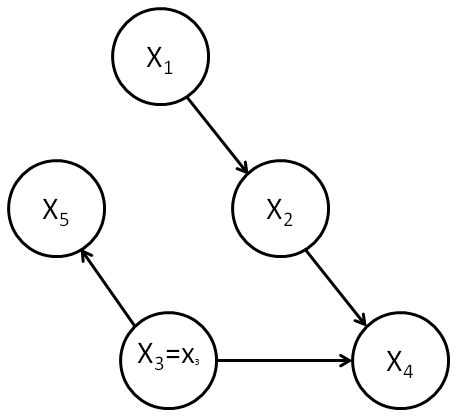 In what follows, we have a causal model on a graph , and are disjoint subsets of the variables in the causal model. Recall also that denotes the perturbed graph in which all edges pointing to from the parents of have been deleted. This is the graph which results when an experimenter intervenes to set the value of , overriding other causal influences on . Rule 1: When can we ignore observations: I’ll begin by stating the first rule in all its glory, but don’t worry if you don’t immediately grok the whole rule. Instead, just take a look, and try to start getting your head around it. What we’ll do then is look at some simple special cases, which are easily understood, and gradually build up to an understanding of what the full rule is saying. To understand why this rule is true, and what it means, let’s start with a much simpler case. Let’s look at what happens to the rule when there are no or variables in the mix. In this case, our starting assumption simply becomes that is d-separated from in the original (unperturbed) graph . There’s no need to worry about because there’s no variable whose value is being set by intervention. In this circumstance we have , so is independent of . But the statement of the rule in this case is merely that , which is, indeed, equivalent to the standard definition of and being independent. In other words, the first rule is simply a generalization of what it means for and to be independent. The full rule generalizes the notion of independence in two ways: (1) by adding in an extra variable whose value has been determined by passive observation; and (2) by adding in an extra variable whose value has been set by intervention. We’ll consider these two ways of generalizing separately in the next two paragraphs. We begin with generalization (1), i.e., there is no variable in the mix. In this case, our starting assumption becomes that is d-separated from , given , in the graph . By the graphical criterion for conditional independence discussed in the last section this means that is conditionally independent of , given , and so , which is exactly the statement of the rule. And so the first rule can be viewed as a generalization of what it means for and to be independent, conditional on . Now let’s look at the other generalization, (2), in which we’ve added an extra variable whose value has been set by intervention, and where there is no variable in the mix. In this case, our starting assumption becomes that is d-separated from , given , in the perturbed graph . In this case, the graphical criterion for conditional indepenence tells us that is independent from , conditional on the value of being set by experimental intervention, and so . Again, this is exactly the statement of the rule. The full rule, of course, merely combines both these generalizations in the obvious way. It is really just an explicit statement of the content of the graphical criterion for conditional independence, in a context where has been observed, and the value of set by experimental intervention. The rules of the causal calculus: All three rules of the causal calculus follow a similar template to the first rule: they provide ways of using facts about the causal structure (notably, d-separation) to make inferences about conditional causal probabilities. I’ll now state all three rules. The intuition behind rules 2 and 3 won’t necessarily be entirely obvious, but after our discussion of rule 1 the remaining rules should at least appear plausible and comprehensible. I’ll have bit more to say about intuition below. As above, we have a causal model on a graph , and are disjoint subsets of the variables in the causal model. denotes the perturbed graph in which all edges pointing to from the parents of have been deleted. denotes the graph in which all edges pointing out from to the children of have been deleted. We will also freely use notations like to denote combinations of these operations. In a sense, all three rules are statements of conditional independence. The first rule tells us when we can ignore an observation. The second rule tells us when we can ignore the act of intervention (although that doesn’t necessarily mean we can ignore the value of the variable being intervened with). And the third rule tells us when we can ignore an intervention entirely, both the act of intervention, and the value of the variable being intervened with. I won’t prove rule 2 or rule 3 – this post is already quite long enough. (If I ever significantly revise the post I may include the proofs). The important thing to take away from these rules is that they give us conditions on the structure of causal models so that we know when we can ignore observations, acts of intervention, or even entire variables that have been intervened with. This is obviously a powerful set of tools to be working with in manipulating conditional causal probabilities! Indeed, according to Pearl there’s even a sense in which this set of rules is complete, meaning that using these rules you can identify all causal effects in a causal model. I haven’t yet understood the proof of this result, or even exactly what it means, but thought I’d mention it. The proof is in papers by Shpitser and Pearl and Huang and Valtorta. If you’d like to see the proofs of the rules of the calculus, you can either have a go at proving them yourself, or you can read the proof. Suppose the conditions of rules 1 and 2 hold. Can we deduce that the conditions of rule 3 also hold? The great benefit of this model was that it included as special cases both the hypothesis that smoking causes cancer and the hypothesis that some hidden causal factor was responsible for both smoking and cancer. It turns out, unfortunately, that the causal calculus doesn’t help us analyse this model. I’ll explain why that’s the case below. However, rather than worrying about this, at this stage it’s more instructive to work through an example showing how the causal calculus can be helpful in analysing a similar but slightly modified causal model. So although this modification looks a little mysterious at first, for now I hope you’ll be willing to accept it as given. Our goal in this modified causal model is to compute probabilities like . What we’ll show is that the causal calculus lets us compute this probability entirely in terms of probabilities like and other probabilities that don’t involve an intervention, i.e., that don’t involve . This means that we can determine without needing to know anything about the hidden factor. We won’t even need to know the nature of the hidden factor. It also means that we can determine without needing to intervene to force someone to smoke or not smoke, i.e., to set the value for . In other words, the causal calculus lets us do something that seems almost miraculous: we can figure out the probability that someone would get cancer given that they are in the smoking group in a randomized controlled experiment, without needing to do the randomized controlled experiment. And this is true even though there may be a hidden causal factor underlying both smoking and cancer. Okay, so how do we compute ? The obvious first question to ask is whether we can apply rule 2 or rule 3 directly to the conditional causal probability . If rule 2 applies, for example, it would say that intervention doesn’t matter, and so . Intuitively, this seems unlikely. We’d expect that intervention really can change the probability of cancer given smoking, because intervention would override the hidden causal factor. If rule 3 applies, it would say that , i.e., that an intervention to force someone to smoke has no impact on whether they get cancer. This seems even more unlikely than rule 2 applying. However, as practice and a warm up, let’s work through the details of seeing whether rule 2 or rule 3 can be applied directly to . Obviously, is not d-separated from in this graph, since and have a common ancestor. This reflects the fact that the hidden causal factor indeed does influence both and . So we can’t apply rule 2. Again, is not d-separated from , in this case because we have an unblocked path directly from to . This reflects our intuition that the value of can influence , even when the value of has been set by intervention. So we can’t apply rule 3. Of course, saying an experienced probabilist would instinctively do this isn’t quite the same as explaining why one should do this! However, it is at least a moderately obvious thing to do: the only extra information we potentially have in the problem is , and so it’s certainly somewhat natural to try to introduce that variable into the problem. As we shall see, this turns out to be a wise thing to do. I used without proof the equation . This should be intuitively plausible, but really requires proof. Prove that the equation is correct. This is the promised expression for (i.e., for probabilities like , assuming the causal model above) in terms of quantities which may be observed directly from experimental data, and which don’t require intervention to do a randomized, controlled experiment. Once is determined, we can compare it against . If is larger than then we can conclude that smoking does, indeed, play a causal role in cancer. Something that bugs me about the derivation of equation  is that I don’t really know how to “see through” the calculations. Yes, it all works out in the end, and it’s easy enough to follow along. Yet that’s not the same as having a deep understanding. Too many basic questions remain unanswered: Why did we have to condition as we did in the calculation? Was there some other way we could have proceeded? What would have happeed if we’d conditioned on the value of the hidden variable? (This is not obviously the wrong thing to do: maybe the hidden variable would ultimately drop out of the calculation). Why is it possible to compute causal probabilities in this model, but not (as we shall see) in the model without tar? Ideally, a deeper understanding would make the answers to some or all of these questions much more obvious. Why is it so much easier to compute than in the model above? Is there some way we could have seen that this would be the case, without needing to go through a detailed computation? Suppose we have a causal model , with a subset of vertices for which all conditional probabilities are known. Is it possible to give a simple characterization of for which subsets and of vertices it is possible to compute using just the conditional probabilities from ? (1) 47.5 percent of the population are nonsmokers with no tar in their lungs, and 10 percent of these get cancer. (2) 2.5 percent are smokers with no tar, and 90 percent get cancer. (3) 2.5 percent are nonsmokers with tar, and 5 percent get cancer. (4) 47.5 percent are smokers with tar, and 85 percent get cancer. By contrast, percent, and so if this data was correct (obviously it’s not even close) it would show that smoking actually somewhat reduces a person’s chance of getting lung cancer. This is despite the fact that percent, and so a naive approach to causality based on correlations alone would suggest that smoking causes cancer. In fact, in this imagined world smoking might actually be useable as a preventative treatment for cancer! Obviously this isn’t truly the case, but it does illustrate the power of this method of analysis. Summing up the general lesson of the smoking-cancer example, suppose we have two competing hypotheses for the causal origin of some effect in a system, A causes C or B causes C, say. Then we should try to construct a realistic causal model which includes both hypotheses, and then use the causal calculus to attempt to distinguish the relative influence of the two causal factors, on the basis of experimentally accessible data. Incidentally, the kind of analysis of smoking we did above obviously wasn’t done back in the 1960s. I don’t actually know how causality was established over the protestations that correlation doesn’t impy causation. But it’s not difficult to think of ways you might have come up with truly convincing evidence that smoking was a causal factor. One way would have been to look at the incidence of lung cancer in populations where smoking had only recently been introduced. Suppose, for example, that cigarettes had just been introduced into the (fictional) country of Nicotinia, and that this had been quickly followed by a rapid increase in rates of lung cancer. If this pattern was seen across many new markets then it would be very difficult to argue that lung cancer was being caused solely by some pre-existing factor in the population. Construct toy model data where smoking increases a person’s chance of getting lung cancer. What would have happened if we’d tried to use the causal calculus to analyse this model? I won’t go through all the details, but you can easily check that whatever rule you try to apply you quickly run into a dead end. And so the causal calculus doesn’t seem to be any help in analysing this problem. So we could try instead to use the causal calculus to analyse this new model. I haven’t gone through this exercise, but I strongly suspect that doing so we wouldn’t be able to use the rules of the causal calculus to compute the relevant probabilities. The intuition behind this suspicion is that we can imagine a world in which the tar may be a spurious side-effect of smoking that is in fact entirely unrelated to lung cancer. What causes lung cancer is really an entirely different mechanism, but we couldn’t distinguish the two from the statistics alone. The point of this isn’t to say that the causal calculus is useless. It’s remarkable that we can plausibly get information about the outcome of a randomized controlled experiment without actually doing anything like that experiment. But there are limitations. To get that information we needed to make some presumptions about the causal structure in the system. Those presumptions are plausible, but not logically inevitable. If someone questions the presumptions then it may be necessary to revise the model, perhaps adopting a more sophisticated causal model. One can then use the causal calculus to attempt to analyse that more sophisticated model, but we are not guaranteed success. It would be interesting to understand systematically when this will be possible and when it will not be. The following problems start to get at some of the issues involved. Is it possible to make a more precise statement than “the causal calculus doesn’t seem to be any help” for the original smoking-cancer model? Given a probability distribution over some random variables, it would be useful to have a classification theorem describing all the causal models in which those random variables could appear. Extending the last problem, it’d be good to have an algorithm to answer questions like: in the space of all possible causal models consistent with a given set of observed probabilities, what can we say about the possible causal probabilities? It would also be useful to be able to input to the algorithm some constraints on the causal models, representing knowledge we’re already sure of. In real-world experiments there are many practical issues that must be addressed to design a realiable randomized, controlled experiment. These issues include selection bias, blinding, and many others. There is an entire field of experimental design devoted to addressing such issues. By comparison, my description of causal inference ignores many of these practical issues. Can we integrate the best thinking on experimental design with ideas such as causal conditional probabilities and the causal calculus? From a pedagogical point of view, I wonder if it might have been better to work fully through the smoking-cancer example before getting to the abstract statement of the rules of the causal calculus. Those rules can all be explained and motivated quite nicely in the context of the smoking-cancer example, and that may help in understanding. I’ve described just a tiny fraction of the work on causality that is now going on. My impression as an admittedly non-expert outsider to the field is that this is an exceptionally fertile field which is developing rapidly and giving rise to many fascinating applications. Over the next few decades I expect the theory of causality will mature, and be integrated into the foundations of disciplines ranging from economics to medicine to social policy. Causal discovery: One question I’d like to understand better is how to discover causal structures inside existing data sets. After all, human beings do a pretty good (though far from perfect) job at figuring out causal models from their observation of the world. I’d like to better understand how to use computers to automatically discover such causal models. I understand that there is already quite a literature on the automated discovery of causal models, but I haven’t yet looked in much depth at that literature. I may come back to it in a future post. I’m particularly fascinated by the idea of extracting causal models from very large unstructured data sets. The KnowItAll group at the University of Washington (see Oren Etzioni on Google Plus) have done fascinating work on a related but (probably) easier problem, the problem of open information extraction. This means taking an unstructured information source (like the web), and using it to extract facts about the real world. For instance, using the web one would like computers to be able to learn facts like “Barack Obama is President of the United States”, without needing a human to feed it that information. One of the things that makes this task challenging is all the misleading and difficult-to-understand information out on the web. For instance, there are also webpages saying “George Bush is President of the United States”, which was probably true at the time the pages were written, but which is now misleading. We can find webpages which state things like “[Let’s imagine] Steve Jobs is President of the United States“; it’s a difficult task for an unsupervised algorithm to figure out how to interpret that “Let’s imagine”. What the KnowItAll team have done is made progress on figuring out how to learn facts in such a rich but uncontrolled environment. What I’m wondering is whether such techniques can be adapted to extract causal models from data? It’d be fascinating if so, because of course humans don’t just reason with facts, they also reason with (informal) causal models that relate those facts. Perhaps causal models or a similar concept may be a good way of representing some crucial part of our knowledge of the world. What systematic causal fallacies do human beings suffer from? We certainly often make mistakes in the causal models we extract from our observations of the world – one example is that we often do assume that correlation implies causation, even when that’s not true – and it’d be nice to understand what systematic biases we have. Humans aren’t just good with facts and causal models. We’re also really good at juggling multiple causal models, testing them against one another, finding problems and inconsistencies, and making adjustments and integrating the results of those models, even when the results conflict. In essence, we have a (working, imperfect) theory of how to deal with causal models. Can we teach machines to do this kind of integration of causal models? We know that in our world the sun rising causes the rooster to crow, but it’s possible to imagine a world in which it is the rooster crowing that causes the sun to rise. This could be achieved in a suitably designed virtual world, for example. The reason we believe the first model is correct in our world is not intrinsic to the data we have on roosters and sunrise, but rather depends on a much more complex network of background knowledge. For instance, given what we know about roosters and the sun we can easily come up with plausible causal mechanisms (solar photons impinging on the rooster’s eye, say) by which the sun could cause the rooster to crow. There do not seem to be any similarly plausible causal models in the other direction. How do we determine what makes a particular causal model plausible or not? How do we determine the class of plausible causal models for a given phenomenon? Can we make this kind of judgement automatically? (This is all closely related to the last problem). This model represents the fact that what we eat determines our insulin levels, and our insulin levels in turn play a part in determining how hungry we feel, and thus what we eat. But as a model, it’s quite inadequate. In fact, there’s a much more complex feedback relationship going on, a constant back-and-forth between what we eat at any given time, and our insulin levels. Ideally, this wouldn’t be represented by a few discrete events, but rather by a causal model that reflects the continual feedback between these possibilities. What I’d like to see developed is a theory of continuous-time causal models, which can address this sort of issue. It would also be useful to extend the calculus to continuous spaces of events. So far as I know, at present the causal calculus doesn’t work with these kinds of ideas. Can we formulate theories like electromagnetism, general relativity and quantum mechanics within the framework of the causal calculus (or some generalization)? Do we learn anything by doing so? Other notions of causality: A point I’ve glossed over in the post is how the notion of causal influence we’ve been studying relates to other notions of causality. The notion we’ve been exploring is based on the notion of causality that is established by a (hopefully well-designed!) randomized controlled experiment. To understand what that means, think of what it would mean if we used such an experiment to establish that smoking does, indeed, cause cancer. All this means is that in the population being studied, forcing someone to smoke will increase their chance of getting cancer. Now, for the practical matter of setting public health policy, that’s obviously a pretty important notion of causality. But nothing says that we won’t tomorrow discover some population of people where no such causal influence is found. Or perhaps we’ll find a population where smoking actively helps prevent cancer. Both these are entirely possible. What’s going on is that while our notion of causality is useful for some purposes, it doesn’t necessarily say anything about the details of an underlying causal mechanism, and it doesn’t tell us how the results will apply to other populations. In other words, while it’s a useful and important notion of causality, it’s not the only way of thinking about causality. Something I’d like to do is to understand better what other notions of causality are useful, and how the intervention-based approach we’ve been exploring relates to those other approaches. Thanks to Jen Dodd, Rob Dodd, and Rob Spekkens for many discussions about causality. Especial thanks to Rob Spekkens for pointing me toward the epilogue of Pearl’s book, which is what got me hooked on causality! A readable and stimulating overview of causal inference is the epilogue to Judea Pearl’s book. The epilogue, in turn, is based on a survey lecture by Pearl on causal inference. I highly recommend getting a hold of the book and reading the epilogue; if you cannot do that, I suggest looking over the survey lecture. A draft copy of the first edition of the entire book is available on Pearl’s website. Unfortunately, the draft does not include the full text of the epilogue, only the survey lecture. The lecture is still good, though, so you should look at it if you don’t have access to the full text of the epilogue. I’ve also been told good things about the book on causality by Spirtes, Glymour and Scheines, but haven’t yet had a chance to have a close look at it. An unfortunate aspect of the current post is that it gives the impression that the theory of causal inference is entirely Judea Pearl’s creation. Of course that’s far from the case, a fact which is quite evident from both Pearl’s book, and the Spirtes-Glymour-Scheines book. However, the particular facets I’ve chosen to focus on are due principally to Pearl and his collaborators: most of the current post is based on chapter 3 and chapter 1 of Pearl’s book, as well as a 1994 paper by Pearl, which established many of the key ideas of the causal calculus. Finally, for an enjoyable and informative discussion of some of the challenges involved in understanding causal inference I recommend Jonah Lehrer’s recent article in Wired. Interested in more? Please follow me on Twitter. You may also enjoy reading my new book about open science, Reinventing Discovery. Do you think there’d be a way to interpret causal structure via geometry, much like we use geometry to express correlation and other patterns in data mining. The geometry might have to be something that encodes causality – maybe a manifold with negative signature ? @Suresh – Fascinating idea! No idea if it’s possible, though, the thought never crossed my mind. I guess I think of causal models as having an inherent directionality, due to the dag structure, while most geometries don’t have the same kind of directionality. But maybe there’s some trick to get around that. There’s been plenty of work on the geometry of curved exponential families, and their relation to inference in graphical models. See, as a start, e.g. I came across this as I was interested in oral thrush. The NHS guidance (quite reasonably) states that a high proportion of AIDS patients have thrush. Thrush has many causes and is correlated with use of inhaled steroids. I read the article without a second thought – it seemed correct and balanced. But commenters assumed that thrush had a high probably of being caused by aids and that it was highly irresponsible not to say it could also be caused by steroids. I don’t know the answer. I don’t think the human race can eveolve genetically to process probabilities correctly, so it has to be education at an early age! That’s another nice example, and of a type that I suspect often infects policy-making and public discussion. 1. If there’s an alternative ??? path from smoking to lung cancer it may be possible to put bounds on P(cancer|dio(smoking)) even if you can’t compute it exactly. 2. Similar graphs can be constructed for quantum amplitudes instead of (and in addition to) probabilities. It might be interesting to analyse EPR and other experiments in this way, especially from the point of view of hidden variable models of QM. I have been working on formulating quantum theory in a Bayesian network language, which is an obvious precursor to developing a causal calculus for it. Even that problem is not so simple, given that the standard formalism has an assumed causal structure built into it, which we need to get rid of before we start. My recent papers with Rob Spekkens are part of an attempt to do that. One lesson that I have learned from this is that we need to get away from the usual “initial state+dynamics” way of looking at physics in order to fit it into this framework. Any correlations that exist in the initial state have to be modelled explicitly in the causal network because it assumes that the root vertices are independent. Finally, let me just mention that you might be able to get away with a simpler structure for modelling causality in deterministic theories like electromagnetism. Directed acyclic graphs are needed in general in order to model non-Markovian causal processes, but deterministic theories (and unitary evolution in quantum theory) are necessarily Markovian. Therefore, you should be able to get away with just using a poset to model causality in these cases, the corresponding DAG being just the Hasse diagram of the poset. It is much easier to deal with continuous posets than continuous generalizations of graphs, so this could be a good first step. By the way, this explains why Raphael Sorkin et. al. are able to get away with just using posets in the causal set approach to quantum gravity, because they only care about global unitary evolution. Nice exposition! Perhaps some notion of “latent surprise” could be relevant. Adapting from the Wired article you cite, imagine that a candidate drug’s operation has two plausible causal models. The first and most plausible model is simple. It is used during drug development. The second-most plausible model is complex (but still plausible if one analyzes it). If that second-most plausible causal model is very different from the first, that could be a “latent surprise” for researchers – a warning that, if their understanding of the drug’s operation changes somewhat, the clinical effects could be profound. In general, if the most plausible few models are close (in the metric of plausibility) yet very different (in the metric space of causal model similarity), this is a warning of big latent surprises if our understanding shifts a bit. Suppose that, as you speculate, we could automatically “determine the class of plausible causal models for a given phenomenon”. We might then also be able to scan automatically for latent surprises in important systems: scientific, social, financial, policy, and so forth. Loops in causality DAG can be created without time machines as follows. 4. so on and so forth. 5. Over time, A, B, and C have caused other variables due to unknown reasons. So, to the observer, A caused B, which caused C, which (in turn) caused A. This situation could happen in Human History due to lapses in measurement and in Astronomy because the lifetime of the observed (universe) is much longer than the lifetime of the observer (humans). Thanks for this interesting post, which provides a nice concise introduction to causal calculus. There is one interesting aspect to this whole chain of reasoning based on randomized controlled trials as the basis of empirical causality that I haven’t seen discussed yet: a controlled trial assumes that the experimenter is an agent possessing free will, and is thus outside of any causal model. There is a recent tendency in the scientific community (see this article for example, and my comments on it) to claim that free will does not exist, and that human behavior is governed entirely by molecular processes (and thus ultimately quantum physics). With that assumption, whatever an experimenter does is merely one more observable in a stochastic network, randomized controlled trials disappear, and causal calculus disappears as well. We arrive at the conclusion that the only scientific method to attribute causality relies on the existence of free will as a source of “obvious” causality. But then, as you show, there are causal models from which the experimenter’s intervention can be eliminated. We can thus draw conclusions about causality without assuming the “obvious” source of free will. I wonder if it is possible to state under which conditions a causal model permits this elimination. Rules 2 and 3 are about individual variables, but is there a rule that applies to a complete graph? Thanks for this. I’ve been spending a lot of time thinking about Pearl’s book lately and this is by far the most accessible introduction to the material that I have come across. Of interest for our question about algorithms: http://www.phil.cmu.edu/projects/tetrad/. Probably you meant the other way around: “amusing examples of the dangers of inferring causation from correlation”? where f_j is a function, and Y_j is a collection of random variables such that: (a) the Y_j,. are independent of one another for different values of j; and (b) for each j, Y_j,. is independent of all variables X_k, except when X_k is X_j itself, or a descendant of X_j. The intuition is that the are a collection of auxiliary random variables which inject some extra randomness into X_j (and, through X_j, its descendants), but which are otherwise independent of the variables in the causal model. What you mean by that is that for instance in the diagram above the paragraph Y_4,i is not independent of X_3 and X_2? No the Y_4,i’s are independent of X_3 and X_2. The only way this could fail is if condition (b) is met. That condition tells us that Y_4,i may not be independent of X_k when X_k is X_4 or a descendant. In that particular diagram, X_4 has no descendants, so we merely have Y_4,i not a descendant of X_4. Thanks for writing this up. It was very helpful! which is much more transparent. My mistake. I thought I had marginalized out the x’, but didn’t. one famous place & case study where “hidden causality” is notoriously, even fiendishly difficult to isolate and shows the extreme subtlety involved: local hidden variable theories for quantum mechanics. which recently have been brought back from the dead (or maybe semi zombie state) by anderson/brady in a soliton model. more thoughts on that here. it has an aura of unorthodoxy but lets not forget that the greats have always been enamored with the idea. einstein, schroedinger, ‘t hooft, etcetera. part of the difficulty in QM is the idea of counterintuitive variables that might actually cause the experiment apparatus to “measure” or “not measure” (or “click” vs “not click/silent”). this has been called a “conspiracy” for decades. not sure who invented that description. Goes into causal detection based upon ‘prediction when variable A has been removed’, and why correlation sometimes makes causal detection worse, not better. We can’t have X causing Y causing Z causing Y! I noticed I incorrectly quoted you above, but the point is, loops in causal diagrams are common. The labels in the diagrams aren’t just for broad classes of phenomena, they’re labels for random variables. 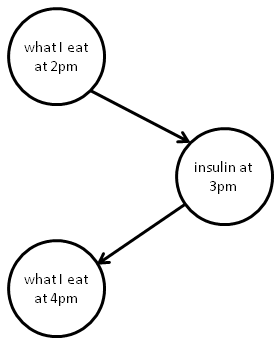 A reasonable informal way of thinking is that this means you should think of the nodes as referring to specific events. Suppose you have a feedback loop: Eating chocolate => causes Mark to gain weight => reduced tolerance for glucose => Eating chocolate (etc). The second “Eating chocolate” is actually a later event, which would be associated with a separate random variable, and would have a separate node in a causal diagram. Incidentally, that informal way of thinking – nodes as specific events in time – isn’t the full story. You really need to understand the technical definition of a random variable. But this informal approach conveys the gist of what’s going on. In , I’m confused how to expand the right side; I don’t see where I can get the values for pa(Xj). 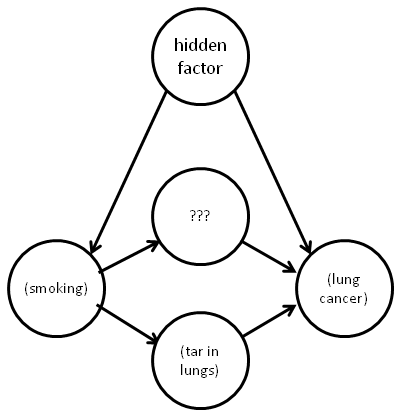 I’m trying to expand the basic cancer-smoking-hidden model in terms of basic probabilities, and I can only get as far as P(gets cancer | do(smokes)) = P(gets cancer, smokes) / P(smokes | pa(Smoke)). pa(.) 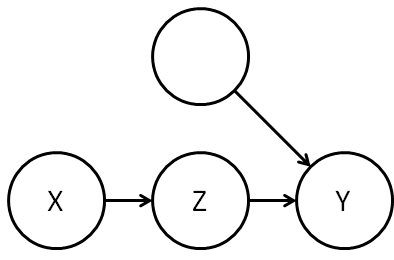 is just used to denote the parents of a node (or collection of nodes) in the causal graph. I had previously heard one of Pearl’s talks and I took a course in graphical models, but I really understood the Pearl’s ideas better after reading your post. Thanks. Hello, thanks for this nice explanation of Pearl’s & al. theory. But there is something I can’t grasp in spite of reading Pearl’s lecture slides or some parts of his papers. But rule 2 is much more complex than this. It tells about x,y,z and w.
How can you make disappear y and w in rule 2 ? Is it because w is unobserved ? Is it because pa(y) = x and we can use another relation ? Okay, after many readings , I guess I’m now able to answer to myself. In the 1992 paper, Pearl derives three properties from  formula. 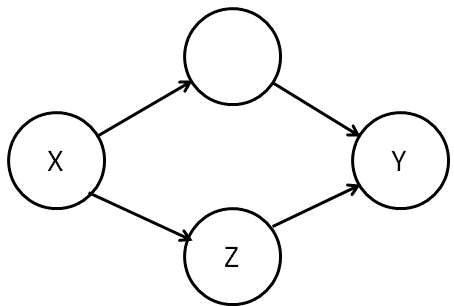 which is the case in the example graph. Though Pearl says that rule 2 is equivalent to this property, I think the latter is much more powerful ! I am trying to understand your eq. ; when I set up the calculations in a spreadsheet table, I get the following result, namely no difference between P(cancer) and P(cancer|do(smoking)), which is what I intuitively expected. Can you tell me where I went wrong? Now we have three regions, NorthEast, NorthWest, and South and the republican % was higher in two out of three. Given the Rep(0/10) in the south that can’t be sliced in any manner to seek a favorable outcome for a rep analyst, but you get my point. I just quickly jotted down a few trials to come up with this example which is not surprising given the initial split into north-south is just a first iteration that demonstrates this is possible. But again I ask, where does the slicing and dicing stop in such an analysis? Usually with these sorts of political and judicial analyses, those things that involve human motivations, it usually stops where the desired outcome is achieved – and the best part is – one can claim it was scientific and mathematical so is indisputable! The analyst can say under oath and with a straight face,”I lay the numbers before you and the numbers don’t lie.” But just what do the numbers tell us? Your threshold “being Republican, rather than Democrat, was an important factor in causing someone to vote for the Civil Rights Act” is also subjective – as it must be in dealing with human motivations, e.g. what is ‘important’?, what is ‘causing’? One could note the 94Dem/10Rep representation from the south, and analyzing the majority of southern voter’s motivations at that time conclude that a major reason for the big Dem majority in that region was in part caused by the voter’s view that based on platforms and reputation, being Rep, the losing challenger was most likely in favor of the Civil Rights Act. I’ve applied Simpson’s Paradox to the North vote split. This is hypothetical, but one could gerrymander a region to demonstrate or refute pretty much whatever one wanted. Sorry I’m a little late to the party… but I’ve been busy doing a lot of work in what I’m calling a “science of conceptual systems” where a conceptual system is a set of interrelated concepts (theories, models, mental models, policies, strategic plans, etc.). There, i analyze the evolution of a theory of physics from ancient times through the scientific revolution. By focusing on causal relationships, and concatenated relationships between nodes, we gain rather useful insights into how to create more effective theories and policies. This is important because, within the social sciences, our current theories fail far more often than they succeed. imagine what we might be able to accomplish if our economic policies worked twice as well as they do? What about theories of management and psychology? Double the effectiveness and watch what happens to organizational and mental health! 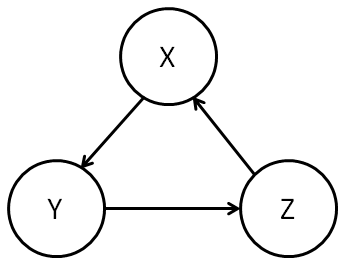 In the example you gave about the music academy, and Berkson’s paradox, there should be another node in the graph: that X gives information about Y if and only if X and Y have some other (external) connection. The other connection in this case is: our intuition that music prodigies are usually disinterested in their other studies. So, you cannot proceed to the principle that when X –> Z <– Y, X gives information about Y, i.e. that the path is unblocked. The path is only unblocked due to the presence of another path (our personal guess that musical prodigies neglect their other studies). In the example you gave about the music academy, and Berkson’s paradox, there should be another node in the graph: X gives information about Y if and only if X and Y have some other (external) connection. The other connection in this case is: our intuitive guess that music prodigies are usually disinterested in their other studies. So, you cannot proceed to the principle that when X –> Z Z <– Y is blocked.